Treat your feet to soothing, circulation-boosting therapy. Indoor thermal slippers feature a breathable inner layer that wicks away moisture to keep feet dry and comfortable. 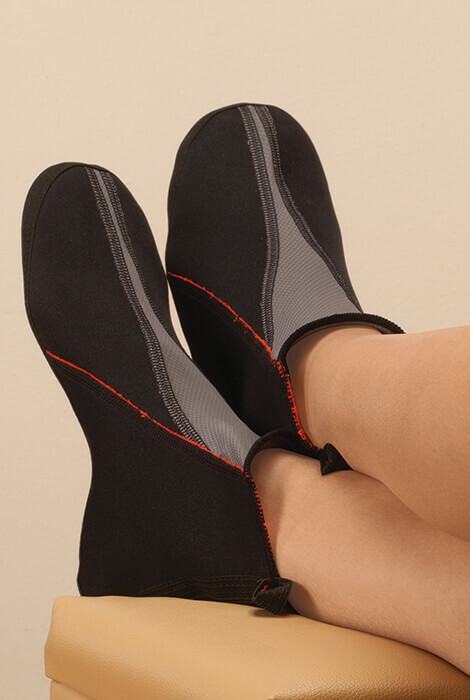 An insulating middle layer keeps feet warm and promotes circulation for healthy legs. A non-slip outer layer with light compression helps alleviate swelling and pain in the plantar fascia and throughout the foot. Safe for extended wear, they're ideal for anyone with arthritis, diabetes, Raynaud syndrome, or cold and sensitive feet. Nylon shell with Trioxon® lining. Breathable inner layer that wicks away moisture. Insulating middle layer keeps feet warm. Non-slip outer layer with light compression. Helps alleviate swelling and pain in the plantar fascia and throughout the foot. Ideal for anyone with arthritis, diabetes, Raynaud syndrome, or cold and sensitive feet. Nylon shell with Trioxon® lining.